As well being the presumed home of Boudicca, warrior queen of the Iceni - a tribe which stretched all the way down to Ipswich, the Saxon capital of East Anglia, the site of a Cluniac Priory in the 12th century, birthplace of the revolutionary thinker Tom Paine, home of Duleep Singh - the last Hindu Maharajah of the Punjab, and in the 1800s the place where Charles Burrell set up his famous engineering works, as well as all this Thetford has a railway station with its name and date incised in a curved segment of brickwork above the door. 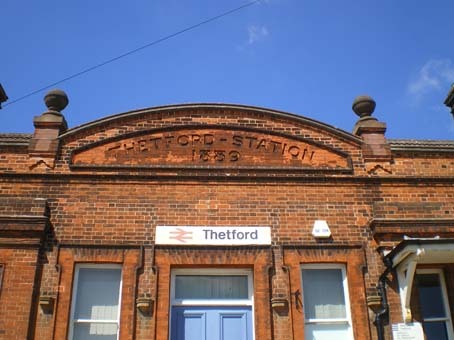 Thetford is on the Cambridge to Norwich line and once served as the terminus for branch lines to Swaffham (closed by Dr Beeching in 1964) and to Bury St Edmunds (closed 1953) which also called at the town's other station Thetford Bridge. 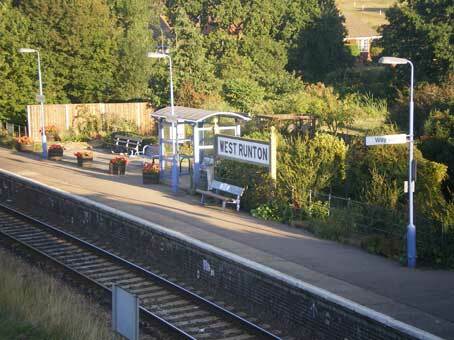 'WEST RUNTON' station on the branch line from Norwich to Sheringham (with plans afoot to remake the level crossing link to the steam line from Sheringham to Holt!). West Runton, if it is known at all, is famous for the West Runton Pavillion: a remote music venue close to the sea which layed host to many touring rock bands in decades gone by. We fondly remember the Rock Against Racism tour featuring The Ruts, Gang Of Four and Misty In Roots. Oh yes, and West Runton is dominated by the faux-Tudor fascade of the Links Hotel (popular with golfers) only a few hundred yards accross the green from the rail station. The photograph here is taken from the humpback bridge. But what a huge concrete sign for such a small platform.